Danny and Hannah made it safely to Colon, where we will leave the boat for a week or two. At 1am Danny sent me a photo from the screen he was navigating on and it showed (7) 1000ft ships ahead, among others. It’s a bust place with boats of all sizes waiting their turn to go through the canal. Air tickets are booked for them to fly here to the mainland, and all is well. Today I’ll make my way to CA, take care of some business, and then pick Danny up tomorrow evening. I am beyond excited to see him. Any time away from him is WAY too long! This morning Danny and Hannah had about 100 miles to go. 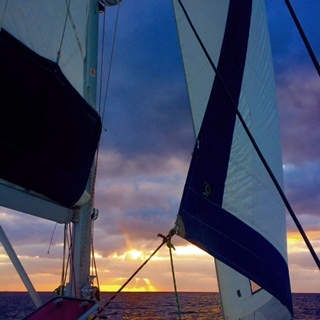 The weather through the night was kind to them with pleasant winds and 2 meter swells. Later in the day swells reached 4 meters (12ft). At this point they have 4 – 5 hours of sailing time left before reaching Shelter Bay in Colon. My drive went really well today. It rained hard for a few hours, which I absolutely loved. I love the way colors and smells become more intense when it rains. I was so taken by the beautiful cloud formations and gorgeous landscape. We live in an incredibly beautiful world! I stopped in St George and visited with our good friends, Chad and Marci Nell. It’s been 3 years since we’ve seen each other, but it felt like we hadn’t skipped a beat in each others lives. What wonderful people. Now I am here in Vegas at my beautiful sister, Christy’s house, and will get a good nights sleep. I am so grateful for many things…a vehicle that works well, loving friends and family, a free country where I can safely travel and the fact that I get to see my sweet Darling and Hannah very soon.